Making a donation in memory is a wonderful was to remember a loved one while helping to support our work. Thank you for thinking of us at this time! Pet memorials can be a helpful and comforting way of remembering and commemorating the life of a pet that is no longer with you. Should you wish to create an online memorial to your pet, simply send us a photo and a message and we will add it to our online Memorial Wall. 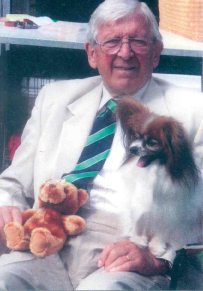 The team at NMWDM charity would like to thank George Henry Morgan’s wife, family and friends for their donations in memory of George – a much loved former TA Captain and Crufts judge. We will be eternally grateful and in your honour. Read more about George Henry Morgan and donating in memorandum.